Home 2017 April 18 Why Does Shakespeare Matter? Some reasons that was given for why Shakespeare is still studied in schools today is the fact that he can change minds said by Guy Roberts. I think he is right but how Shakespeare comes off to me is that he sneaky in a clever way. He has a way of letting the reader know little things to lead up to major things unlike others people they let us in on the secret. In the video I agree to a certain instant when Kim F. Hall says “knowing about foreign lands from book…” yes we were forced to read about the others places in the world through boring books. Shakespeare helped us out in a major way by presenting stories that doesn’t have a one sided view on things. He showed others the way to write and actually draw the audience in. David Tennant said that Shakespeare made up 1700 words and I think we should thank him for helping us improve our english but since we don’t use them so often we should study shakespeare to know where we adapted from. I am currently studying Othello for this playlist. I plan to read until I understand the play. The matter is understanding what’s provided to me and trying to relate it to my life to get a better understanding. Putting myself in the main character(s) shoes. I am kinda confident with the language of the play at the moment. I feel this way because I read a play and actually go the meaning and theme Shakespeare was trying to give the audience. 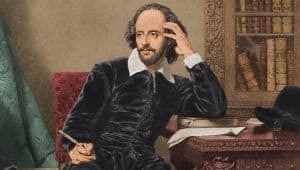 Why Does Shakespeare Matter? by Dania is licensed under a Creative Commons Attribution-ShareAlike 4.0 International License. My personal opinion on safety pinsWhy Shakespeare Still Matter?